Our blog topic of the week is implants and we are going to talk about how dental implants work, what they can be used for, and what happens during the procedure to place the implant. According to the American Association of Implant Prosthodontics, dental implant-related technology has made some of the largest advances in the field of dentistry over the past 30 years. Dental implants have a very high success rate and can be used in a variety of ways to replace missing teeth. At Pelican Landing Dental, we want our patients to receive news related to the most up-to-date dental technology as often as we do. We are happy to help the residents of Bonita Springs, Estero, and surrounding areas. One way that we keep our patients informed about the most current advances in the field of dentistry is with our blog. If you are interested in having dental implants placed or learning more about some of the dental implant treatment options that we talk about today, please visit the implants section of our website. To schedule an appointment or consultation, please contact us at any time electronically or call (239)449-6104. We are happy to answer any questions or concerns that you may have and are committed to ensuring that you are satisfied with your treatment. 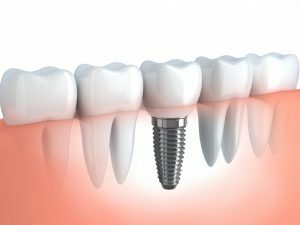 An implant is a small screw that is inserted into your jawbone to anchor a tooth or a set of teeth or dentures to your jaw. The implant is made out of a metal called titanium. This metal is osseointegrated into your bone following surgery. Osseointegration means that your body builds a tight attachment to the implant in a way that keeps it very secure in your jaw. After the implant is placed in the jawbone, your dentist may allow some healing time before he or she attaches the prosthetic teeth to the implant. What Are Some Uses For Dental Implants? Implants can be used to replace one or all of your teeth. An implant is a good way to replace a single missing tooth. In the past, bridges were used to replace missing teeth. When bridges are used, however, some tooth structure has to be taken away from surrounding teeth. Implants are a good solution to replacing a missing tooth that conserves surrounding tooth structure. Multiple implants can be used to replace multiple missing teeth. When implants are used instead of dentures or long-span bridges, they are more comfortable to the patient and more functional for eating and speaking. Implants can be used in two different ways to make dentures more comfortable and functional. They can be used in a removable way with overdentures. Overdentures are designed to snap on and off of your implants. They can also be used in a fixed way with hybrid dentures. Hybrid dentures do not come on and off but must be taken off periodically by your dentist or dental hygienist for regular cleanings. What Can I Expect to Happen During My Dental Implant Appointments? Before your implant is placed, your dentist will speak with you about the various treatment options that exist. Once you all decide on a treatment option, your dentist may need to take different types of images of your jawbone in order to create a plan for the surgery. Your surgery will involve drilling a small hole into the jawbone and then placing the implant in the jawbone. Once the implant has healed a sufficient amount of time, your dentist will attach abutments to the implants. These abutments will serve as anchors for your crowns, bridges, dentures, or hybrids. It may take many appointments to have implants placed and fully restored, but the results will be impressive and it will be worth the effort. We hope that you learned something new from our blog entry today and hope that you check back soon for more updates! If you live in or around the Bonita Springs or Estero area, please feel free to contact us at anytime electronically with any lingering questions that you may have or call (239)449-6104.